Models of science, technology, and innovation (STI) can be employed to simulate the diffusion of ideas and experts, to estimate the impact of population explosion and aging, to explore alternative funding schemas, or to communicate the probable outcomes of different policy decisions. Advances in computational power combined with the availability of relevant data (e.g., publications, patents, funding, clinical trials, stock market, social media data) create ideal conditions for the development and empirical validation of modeling approaches that can be used to simulate and understand future developments and to pick desirable futures. In May 2016, an NSF-funded, agenda-setting conference was held in to review opportunities and challenges associated with the usage of mathematical, statistical, and computational models in STI in decision making (http://modsti.cns.iu.edu). It brought together leading experts from economics, social science, scientometrics and bibliometrics, information science, physics, and science policy that develop mathematical, statistical, and computational models of different types (stochastic, agent-based, epidemics, game-theoretic, network. etc.). The conference also featured talks and panel discussions on current and future STI model needs by representatives from industry, government agencies, university administrators, and other science policy makers. This talk will present key insights gained and a set of challenges for future STI modelling research and development. It will invite comments and encourage a discussion of mutually beneficial opportunities for collaboration. Börner, Katy. 2016. Data-Driven Science Policy. Issues in Science and Technology. Spring Issue. Börner, Katy and Staša Milojević (Eds.) (2016) Modeling Science, Technology and Innovation. NSF Conference Report, Indiana University. Börner, Katy, Bruce Edmonds, Stasa Milojevic, and Andrea Scharnhorst, eds. 2016. "Simulating the Processes of Science, Technology, and Innovation". Scientometrics. Scharnhorst, Andrea, Katy Börner, and Peter van den Besselaar, eds. 2012. Models of Science Dynamics: Encounters Between Complexity Theory and Information Science. Springer Verlag. Börner, Katy, Wolfgang Glänzel, Andrea Scharnhorst, and Peter van den Besselaar, eds. 2011. "Modeling science: Studying the structure and dynamics of science". Scientometrics 89 (1): 346-463. Börner, Katy, and Andrea Scharnhorst. 2009. "Visual Conceptualizations and Models of Science". Special Issue on the Science of Science: Conceptualizations and Models of Science, Journal of Informetrics 3 (3): 161-172. Börner, Katy, Jeegar Maru, and Robert Goldstone. 2004. "The Simultaneous Evolution of Author and Paper Networks". Proceedings of the National Academy of Sciences of the United States of America 101 (Suppl. 1): 5266-5273. Katy Börner is the Victor H. Yngve Distinguished Professor of Information Science in the Department of Information and Library Science, School of Informatics and Computing, Adjunct Professor at the Department of Statistics in the College of Arts and Sciences, Core Faculty of Cognitive Science, Member of the Advanced Visualization Laboratory, Founding Director of the Cyberinfrastructure for Network Science Center at Indiana University, Bloomington, IN, Visiting Professor at the Royal Netherlands Academy of Arts and Sciences (KNAW) in The Netherlands, and Visiting Professor and Mercator Fellow, Department of Computer Science and Applied Cognitive Science, University of Duisburg-Essen, Germany. 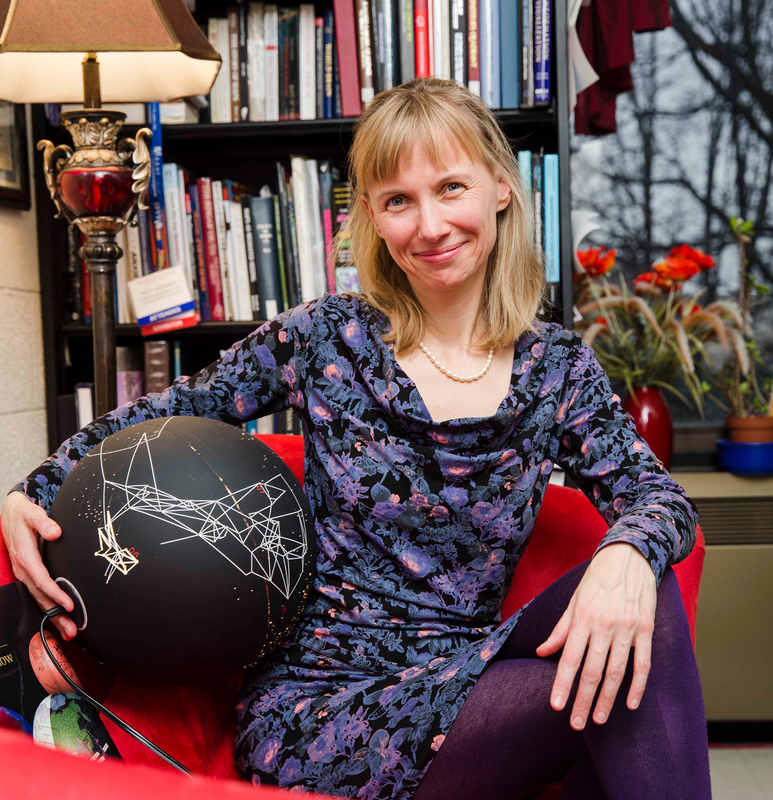 She is a curator of the international Places & Spaces: Mapping Science exhibit and the author of the Atlas of Knowledge and Atlas of Science (MIT Press). She holds a MS in Electrical Engineering from the University of Technology in Leipzig, 1991 and a Ph.D. in Computer Science from the University of Kaiserslautern, 1997. She became an American Association for the Advancement of Science (AAAS) Fellow in 2012.